Which middle school is this? Why is this Connecticut middle school so unique? This is CELC. CT Experiential Learning Center, founded in 2009 by educators Melinda Alcosser and Maria Mortali. It is an experientially based middle school where thinking and learning are highly valued. At CELC a new paradigm exists: Imagine middle school years as joyful, exciting, boundless, …? What does “experientially based education” really mean? The learning and teaching happens through experience. CELC’s academics are rigorous, yet with its small-by-design structure, the curriculum can be personalized to meet students where they are. Within the classroom, students are able to have questions answered in real time. The learning goes into depth, rather than just skimming the surface. Building skills for the 21stand 22ndcentury includes learning to think creatively, to problem solve, to work and get along with others in collaborative groups. This asks that students be a part of the wider world as part of their learning. Being in a classroom is a large part of a CELC education, yet students regularly are outside of those classroom walls, traveling to a variety of locations where they interact and experience life and their participation in it. What is it that makes this approach so transformational for students? Working hard is the norm. CELC is not a place where students fall through the cracks. Each person is expected and required to stretch and grow as part of this experience. Otherwise the point is lost, cannot and will not have its intended meaning. Each student will, in this small community, find his or her “edge”, where it may seem for those moments that things are just too difficult to maneuver. It could be fear of writing, or lack of confidence speaking in front of others, approaching math, working well within a group. The list goes on. Kayaking on open water, milking a cow, speaking with another student about a conflict in order to find reconciliation. Real learning, the stuff that builds true grit and self-awareness is the growth that CELC education offers; it is not always an easy path, yet comes with tangible reward. In an experiential education setting, students approach each new day with new excitement, diving into their own leaning as the opportunities unfold, always encouraged to try. Through a stepwise approach and self-discovery, growth is the inevitable result. This type of learning is long lasting and carries students through life. It is why we have parents, such as C. Riegle whose son attended CELC from 5th-8thgrade (class of 2014), claim his CELC middle school years are what she credits to his being so successful as a current freshman at Penn State University studying Architectural Landscape Design. CELC is where he was able to launch and discover his potential. He had to apply himself for sure, that was up to him. CELC provided the right setting for him to be able to do just that. Why is it that people have not heard of CELC and how does this “microschool” get out the word? Although it has been difficult to become known since CELC is such a small school, CELC does not intend to remain the best-kept secret, but rather be known as a resource in Connecticut on the Shoreline. This being CELC’s tenth-year anniversary, it is about time to get CELC on the mapand become a household name! This resource may be the answer toward bringing a young adolescent through these years in a solid, meaningful and happy way, developing the strengths and capabilities to continue as a student who feels confident and capable to take on the challenges and opportunities along the path of learning. Middle school years are often disregarded, accepted as merely awful. That can be an old norm. The ages of 10 – 14 are such pivotal and critical years of development, where students start to become who they will be. Habits form, personality takes shape, attitude is paramount. Middle school can be a tumultuous time. This time of life brings enormous change. Hormones as driver means that there are ups and downs, emotional upset, and in today’s faced-paced digital world, a reality that being a kid does not last as long as it once did. A student who is eager to come to school, to participate in daily encounters with new learning and new experiences, one’s relationship to learning and “school” shifts from that of dread to openness and possibility. If you have a child who is struggling through middle school or is getting “A”s yet not finding it challenging or satisfying, you may want to consider your options. When a school is the “right fit” for a student, it brings such affirmation and opens up incredible possibility. Find out for yourself whether CELC is a right fit for your child. Contact CELC today! 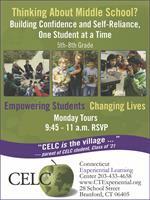 Visit for a Monday Tour, come to an Open House, visit CELC’s website www.ctexperiential.org. Call to speak with Melinda or Maria 203.433.4658. The option is available – CELC Middle School really does exist and is ready to serve those who can benefit. There are only a few openings available now for 2019-20. Contact CELC today for more information.